Looking for a whiter smile? 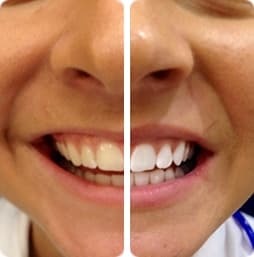 Here at PureSmile we are teeth-whitening specialists with a difference with stores in Sydney, Melbourne, Brisbane, Perth, Gold Coast, Cairns and Adelaide. We have the know-how to make teeth whiter using 100% safe and long-lasting treatment. Our team of specialists developed highly effective all-natural Peroxide-FREE and Hydrogen Peroxide teeth whitening treatments. Our gels are freshly made in the USA using mineral based ingredients and are vegan, certified kosher and not tested on animals. What’s more we use a dental grade state-of-the-art LED teeth whitening technology trusted by dentists worldwide to deliver top results while the whitening process is gentle on your teeth and gums. To be able to deliver the best teeth whitening results we have partnered with over 30 cosmetic clinics and dentists in Sydney, Melbourne, Brisbane, Gold Coast, Perth, Cairns and Adelaide. Book an appointment online for your teeth whitening treatment in a location that’s convenient for you. If you are unsure whether to choose a cosmetic or dentist teeth whitening treatment please call us on 1300 858 199 for an obligation free consultation. PureSmile is a company dedicated to bringing the newest technology in cosmetic treatments to Australia. We have developed a range of treatments that deliver great results while being gentle to patients. We specialize in cosmetic and dentist teeth whitening, PureSmile LED light therapy rejuvenation treatments, dermal fillers and Plasma Jett technology. How to use Pure Smile whitening foam from Jan on Vimeo.